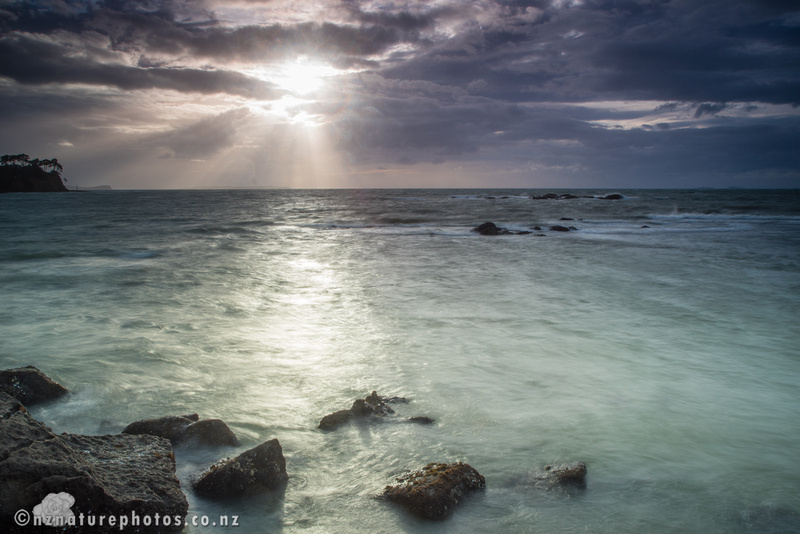 It’s the shortest day in NZ today. We’re also expecting more bad weather. 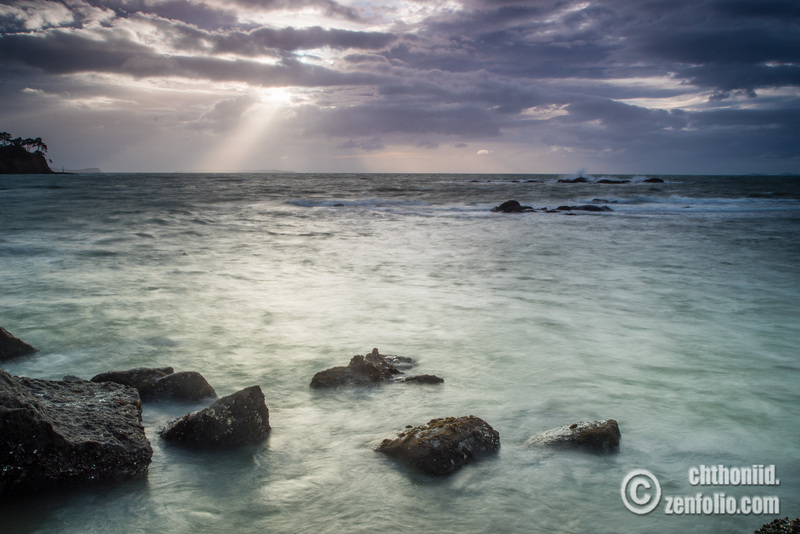 That augured well for some seascape photos down at one of the local beaches. Normally the swells on the gulf around the beaches here are sedate. Unimpressive. A good storm can give them an interesting dynamic. After dropping kiddo 3 at school, I stopped by at Waiake. I kept it simple. My tripod. Its geared head. The Sony a7R (because 36MP is a great size for large prints) and a Minolta 17-35mm f3.5 G. It’s an old Minolta wide angle that I quite like using for landscapes and seascapes. Plus a minimal set of Lee filters. One of the earlier shots. I’m shooting toward the rising, morning sun. The clouds are thickening in this direction. I slowed the shutter down to get a sense of motion in the swell. 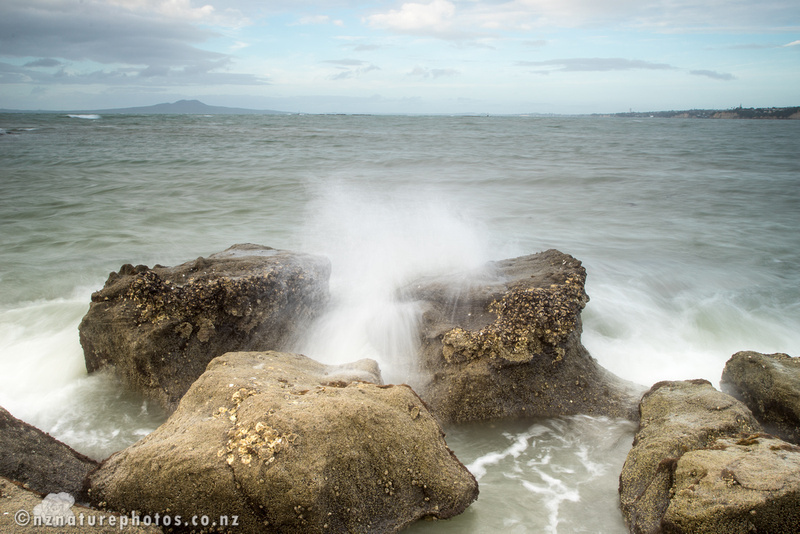 Then its around to the other size to get a view across toward Rangitoto Island. The clouds are not as thick. I’m trying to guess with a 2 second shutter delay, when I should press the shutter to get the waves at the right point. There’s a lot of near misses here. The gale is on its way. The session has its moments. The wind was very gusty, and I was pleased that the tripod held up to it. On the other hand, the sea spray quickly coated my glasses. I was in the end, composing without my glasses and relying on focus peaking to focus the shot properly. I lost my bill-cap briefly as well, as a gust tore it off my head. Fortunately it landed in a rock pool instead. I’m left wondering how much wilder it will be tomorrow. Chthonic Wildlife Ramblings is the blog of Massey University researcher Dr Brendan Moyle. As well as his stunning wildlife and nature photos, you'll find some thoughtful posts here on wildlife loss, poaching and how to combat it. Trevor Oertel on Trading tiger and rhino products: Conservation Threat or Innovation?